We all know about rawhide bones, chews and treats because we’ve seen them on the pet store shelves since the 1950‘s, however, what we may not know is that rawhide products can pose many dangers for your dog. It’s called rawhide because the hide has been left “raw” as opposed to being tanned, and processed simply by removing all meat and hair and then stretching the hide while it dries. Rawhide is what’s left over after all the nutrients have been completely removed from a bull, bison, cow, horse, pig or water buffalo hide. Perhaps understanding how rawhide is processed will help canine guardians understand why this product, that has been big business for pet food manufacturers since the 1950’s could ultimately be a dangerous choice for your dog. During processing, the rawhide is soaked in a solution of ash and lye for a few days to remove all the hair, fat and meat, and then further soaked in bleach to sanitize it and to remove all traces of the ash/lye solution. Once dried, the rawhide shrinks to approximately half of its original size, which is the major reason why this product can cause intestinal blockages. When a dog chews a rawhide product, they ingest many harsh chemicals and when your dog swallows a piece of rawhide, that piece now can swell up to four times its size inside your dog’s stomach, which can cause anything from mild to severe gastric blockages that could become life threatening. 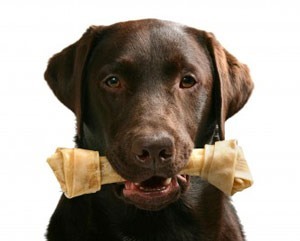 FACT: many surgeries are performed to remove stomach and intestinal blockages from swallowed pieces of rawhide. FACT: Rawhide often provokes aggressive behavior in otherwise friendly, normally non-aggressive dogs who find it so delicious and addictive that they will jealously protect it from other dogs, from children and other family members. Dogs that would never display aggression over other food items, toys or nylon bones become quick to growl, snap, bite or get into fights with another dog or human who might try to interfere with their prized rawhide. NOTE: rawhide is not considered a food item, and therefore is not required to be covered by any labeling, consumer or content laws. Other than the possibility of life threatening gastric blockages, another primary problem with rawhide chews is the bacteria in rawhide (such as Salmonella) that can cause severe gastrointestinal upset that can make your dog very sick, causing vomiting and diarrhea for many days at a time. If you need still more reasons to deter you from buying rawhide treats for your dog, you might want to know that some manufacturers staple their rawhide chews to prevent them from unraveling, which means your dog could also be swallowing staples. Because rawhide is not a regulated food item, this means that it could be an extreme danger for your dog, especially when imported from foreign countries, who may use arsenic, lead, titanium oxide, formaldehyde, chromium salts, mercury, cadmium and bromine in the manufacturing process, as well as high levels of toxic preservatives and harmful antibiotics, which can make your dog very sick. While white rawhide chews may have a greater market appeal to consumers, who assume that because they look cleaner, that this must also mean that they are healthier for our fur friends, keep in mind that some countries use toxic titanium oxide to turn the rawhide white. Further, many chews are basted with a flavor coating to make them more appealing to our dogs. However, once the chew becomes wet from your dog’s saliva, the color begins to come off and may cause staining to your carpeting or your dog’s fur.